AJC Tools & Equipment features a complete selection of residential roofing tools for roofing contractors. Professional-grade, heavy-duty, and guaranteed to last, our core line of residential roofing products have always been proudly made in the USA. Check out all of our roofing tools and our roofing equipment for sale here! Our custom-designed Shing-Go™ roofing shovels are constructed of tough, tempered steel. They feature smooth or serrated blades to bring you the best in tear-off capabilities for any and every application. From our custom-designed Guardian Angle™ knife, designed with precision for cutting shingles, to standard retractable utility knives, our selection of roofing knives makes certain you have the tools needed for roofing applications. Made of lightweight, durable aluminum, the AJC Super Shear™ shingle cutter was designed by professionals, for professionals, to be the best shingle cutting shear available anywhere. Despite its lightweight frame, the spring-loaded shear (patent pending) will safely and accurately cut a tremendous variety of shingles ranging from thin and soft to thick and tough; it can even cut soft metals. Residential roofing installation has never been more efficient, more streamlined, or faster thanks to our complete line of roofing hatchets. Lightweight and designed with roofing contractors in mind, our inventory includes metric, stationary, adjustable, magnetic, wood shingling, and titanium varieties. 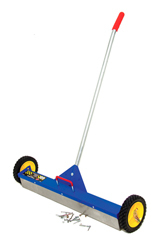 To make clean-up a breeze when the job is done, and to make sure your team and tires stay safe, explore AJC's line of magnetic sweepers and accessories. Our products feature powerful magnets to pull sharp, hazardous debris from multiple surface types; the quick-release design then ensures all debris is quickly and safely discarded.